Most frequently, the task is among the reception responsibilities as the staff deal with the incoming inquiries via various channels. The tasks include phone calls, emails, questions submitted via contact forms or chats. The multitude of contact opportunities raises the risk of chaos when assisting a potential client. This is mainly because the reception staff is burdened with tasks related to the service of guests already visiting the hotel. Due to the large amount of work to be performed in a limited time, they are often unable to respond quickly to emerging residence queries. Thus, a customer, who is accustomed to immediate service in their everyday life, can quit the booking process and choose a hotel or channel which brings the expected sales speed. In addition, one should bear in mind that the number of queries which can be served by a single receptionist is significantly limited. Guest base management and effective communication are yet another challenges for the hoteliers. Most frequently, the potential of the database is not properly used. Even some the larger hotels with reservation departments seek new solutions. Staff turnover, recruitment problems or the lack of time for regular training make the conversion of manually managed channels insufficient. Meanwhile, the value of direct sales from the offline channels is still high. Then, how should we manage this area efficiently? We could use tools which improve the work of the reception staff and booking department. The very first tools dedicated exclusively to the hotel industry emerge on the market. They combine the functionality of traditional CRM systems (Customer Relationship Management) with modern tools to service the hotel sales. Profitroom CRM is there among this group. The system aims at increasing conversion of direct sales, automation of hotel sales, and marketing processes.We encourage you to read the interview with Justyna Urbaniak, Product Owner at Profitroom CRM, who will tell us more about this solution. What is Profitroom CRM and what does it really offer? Profitroom CRM is an innovative tool used to support hotel sales and marketing. The system allows you to gather all your contacts (potential customers and guests) in one place and manage them in a simple and intuitive way. Using Profitroom CRM allows us to prepare personalized offers for stays and services that we can offer to the client. What is more, once the offer is sent, the system ensures that the client does not forget about its existence and he is able to book and pay without any additional contact with the hotel. In addition, we collect all sales opportunities in one place and we can easily control and manage the efficiency of the work of the reception or department responsible for reservations. Yet another thing worth mentioning is the possibility of conducting conference sales. Until now, coordinated activities and organizational aspects were required to prepare, and send an offer, as well as to confirm and make a booking. Profitroom CRM allows hotels to send a conference offer directly from the system. How does it differ from other CRM and marketing automation tools available on the market? There are many marketing automation programs on the market and some hotels may, in fact, use them in their daily work. What makes our product stand out is the full adaptation to the hotel market and integration with the Profitroom Suite systems. Profitroom CRM was created with the hotels in mind. It was co-designed with people having multiple years of experience in the industry, who have brought their insight on the details of the hotel's CRM. The system has been created to combine all the available information about the potential and the current hotel guests in one place and give hoteliers the tools to use the information effectively for sales and marketing purposes. What systems does your CRM link to? Does it download data from other channels used to contact the hotel? The system is fully integrated with Profitroom Suite which means that it can import customer data from the Channel Manager connected to all the major OTAs and the Profitroom Booking Engine system. The system also allows you to connect collective mailboxes, for instance, reception, sales department, marketing, and contact forms on the website. All Inquiries will appear in a special section, the communication can be managed directly with Profitroom CRM! On top of that, the program helps you to effectively and quickly service a potential guest who called the hotel. Having data of the customer's booking history and his activity on the websites, we can do a better job to meet his expectations. What type of hotel does the system work best with? The system works perfectly with all types of hotels which conduct proactive marketing and sales activities. Hotels which actively support individual and group inquiries are particularly beneficial because they take advantage of significant improvements offered by Profitroom CRM in the offering process and service sales. Process automation, which previously had to be performed manually by the hotel management, is a guarantee that each request will be dealt with. Is the product of any use for large hotels with own booking departments? Large hotels receive several dozens of inquiries daily. That makes up for hundreds of messages that reach the booking department via different channels. Employees are able to send an offer to reply to the client, however, there is a problem of continuation. This is due to the fact that a person cannot remember whether the client has already responded to the offer or whether the room the client asked for will soon not be available. One of the advantages of the product is the automatic dispatch of the so-called follow-ups which are email reminders sent to the customer. The solution allows us to increase the chance that the customer who expressed interest and has not decided yet to make a booking will do so when after receiving the automated reminder. In addition, the system always sends the current price and checks the availability of rooms. It is also possible to present and discount offers available exclusively for direct bookings. We can say that Profitroom CRM perfectly combines the offline world of queries with the modern and automated online sales process. Most of CRM systems available on the market are not fully adapted to sales processes of the hotel industry and they don't help but complicate everyday duties with unnecessary bureaucracy. How does your system deal with this problem? We have created the CRM to solve the problem of a mess in the hotel booking management. First, all sales opportunities are gathered in one place. From the sales manager and booking teams point of view, it is a new quality. We can now observe both the bookings and the sales potential from inquiries from various sources. The generated chance for a successful sale is automatically closed and changes the status to 'lost' the moment the client has not paid for the booking until arrival. If, however, the potential customer has made the payment, the program automatically classifies this opportunity as a win. In summary, the entire sales potential is automatically updated. It shows the current status which is easy to interpret with the use of the transparent interface. The hotel guest and client database are often very large. Does the system allow users to classify customers? Yes, of course. This is done by a simple-to-read thermometer indicating the contact temperature. The more activity the individual performs, (for instance, on the hotel's website or booking engine) the higher the rate. Thus, we can see how the interest develops and we can even assist the most interested individuals (people who look at the website in detail) and send them a stay offer before they contact us. Is it possible to reward the loyal customer with the use of Profitroom CRM? The hotelier can create an offer which is not displayed on the website. Thus, we can prepare a personalized stay for the loyal client or the person who contacted the reception by phone. The offer will not be available anywhere else. In addition, we can also grant a discount to the person which contacted us before and, consequently, raise another argument for buying a stay in our hotel. This is the way to reward the client for contacting us directly. Can you send several variants of the offer in response to a single query? Yes, you can send several stay variants to the customer. You can even use the system to make an initial booking for more than one room. Currently, the range of choice is a standard, so the hotelier has the chance to try different sales strategies and also increase the chance of selling the more expensive package. It is also beneficial that we transfer offline sales online, we ensure proper management and a modern approach to hotel guests. Are there any additional benefits of moving sales online? The main benefit is the acceleration of the entire sales process and its partial automation. From the point of view of the hotelier, the offer preparation and sending process take less than a minute. The system automatically supports further communication with the guest. It will also record the successful completion of sales and present it in the form of a transparent report. On the part of the guest, the response to his inquiries arrives immediately and the booking can be made using a convenient online form. Profitroom CRM also allows you to minimize the time required to block a room with the feature of online payments. Having such a tool gives us the opportunity to effectively respond to any request. It boosts direct sales and reduces the percentage of guests which decide to book with an intermediary or choose a different hotel in spite of the previous telephone contact. Can the manager control the number of inquiries and the work of the reception staff? Of course. Profitroom CRM offers the analysis of the sales potential with the information on how many inquiries the hotel has received and how many inquiries have been answered. The managing person has the insight into the information on how many generated sales opportunities ended up with 'wins' and 'losses'. The hotel manager can analyze daily how the hotel staff respond to queries and control the work of subordinates at every stage of the sales process. The stages include creating and sending an offer, sending follow-up messages, and finally, assessing the effects of communication as a win or loss. The sales manager may use a dashboard with a sales funnel, which informs about the stage of the potential sale. 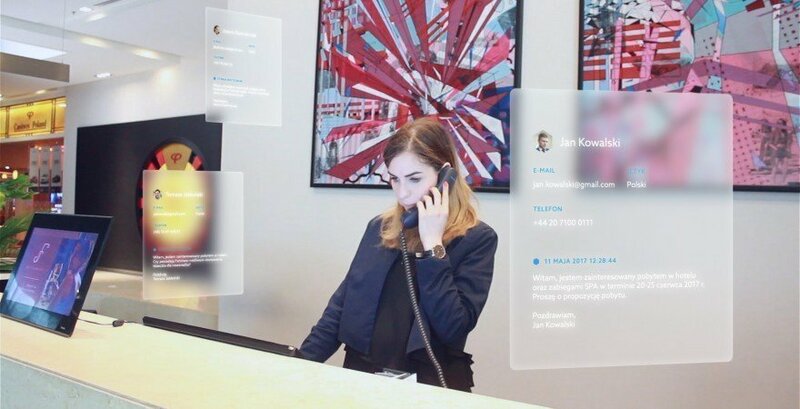 In addition, the system allows you to control the effects of work of individual receptionists. The verification is very simple because each offer has the employee's name and surname automatically assigned based on the login and access to the system. The tool is perfect if you wish to reward your employees and keep them motivated. I have numerous employees working as the reception staff. Do I need to pay extra to use the system? Absolutely not. You can grant access of any level to an infinite amount of users. How long does it take to train an employee to use the system? The system is so simple and intuitive that it does not require extensive training. We have designed it knowing that the rotation of the reception staff is significant and the induction of a new employee generates costs. Considering the specificity of the industry, the system is additionally prepared to be used from the very first day of work. Profitroom CRM helps to show what offers and packages are available in the facility and whether the hotel has rooms available at a given time. The information is displayed immediately, so the employee, for example during a telephone conversation, is able to provide the current information to the potential client even if he does not know the entire offer by heart. Moreover, the receptionist can add additional services such as parking space, additional meals, and other services that are not normally offered with the room. The staff can also see the prices and do not have to check other sources or remember the actual numbers. Profitroom CRM can be purchased and used today. The system was officially launched at the ITB fair in Berlin in March this year. It has been gaining popularity and it is being implemented in numerous hotels throughout the country. Currently, it is in the limited sales phase. Customers buy the product by the end of the year receive additional benefits.